Fowey River oysters, local scallops, West Country meat and Cornish cheeses… hungry yet? ‘Q’ restaurant at The Old Quay House offers excellent dining in a relaxed, unstuffy setting. Forget unsmiling waiters, small portions and whispered conversations, dining here is all about fun and enjoyment – quality local and season produce features heavily on our menu of creative, contemporary dishes. We would like to introduce our new head chef who joined the team in May 2016. Richard Massey has recently moved to Cornwall from Scotland. 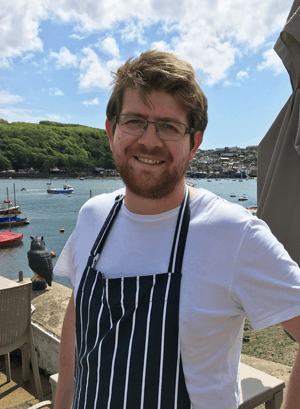 He now lives in Newquay with his partner and is looking forward to making his mark on the menus at The Old Quay House. Check out our quick fire Q&A below to find out more about Richard and his approach. I first started off as a kitchen porter. I became a commis chef at 16 and haven’t looked back since. I have now been cheffing for almost 10 years. Please could you tell us a little about your previous role? I have recently moved to Cornwall from the Isle of Skye, where I was head chef at Ullinish Country Lodge for three years. I was keen to move down to the South West to be closer to family. I was also ready to take on a new challenge. What is your style of cooking and do you have a favourite ingredient? My style is modern British. I like to take classic dishes and ingredients and give them a modern twist. At the moment my favourite ingredient has to be wild garlic, I just love that it’s so fresh and that it grows just minutes away from the hotel. What is your favourite dish on the menu? What is the most popular? My favourite dish is the Kilhallon Beef Fillet – a refined take on a Sunday Roast. It is also one of the most popular amongst our guests, and supplied by local Fowey butcher Kittows. Using local, seasonal ingredients where possible, is key to our ethos. What do you like doing when you’re not in the kitchen? When I’m not in the kitchen I like to be outside, mostly fishing. Other pastimes include experimenting with new dishes in my kitchen at home and tending to my home-grown fruit and vegetables.